Between this shortage, and a market that is increasingly detail-driven, much of what makes Rasa optimistic is that tech is not at odds with farming, but can help refine and target, amplify and extend, the old-fashioned basis of the practice. For Rasa’s family, tech is not replacing farmers, it’s helping them stay farming. To drive to McMinnville, Oregon is to journey through the past, present and future of farming. The Western Willamette Valley is quilted with fields of grain, hops, and grass seed, orchards and berry farms, as well as ag extensions, Monsanto offices, and, this year, the first Oregon Precision Farming Expo, and a new testing ground for civilian drones. The PFE, set amid the Scandinavian futurism of the Evergreen Aviation & Space Museum, featured remote sensing tech, apple picking robots, data crunching software, the aforementioned and increasingly ubiquitous drones, and that rarest tech of all, human farmers. If, in the midst of this glossy world of precision ag, you start to see farming as something more suited for Tatooine (one of the expo’s most popular allusions), getting stuck behind an old truck with a wooden stakebed filled with cow dung going 25 miles an hour will rub at least some of the scifi gloss off. (In the end, you farm in dirt, regardless of how advanced your tools are.) The gloss is pretty shiny, though. Chatting in the lobby of the Evergreen Theater, the general manager of BOSH Precision Agriculture, Young Kim, a leader at the intersection of technology and farming, told The New Stack that, like medicine before it, agriculture is transitioning from an analog practice to a digital one, and that change is going to make all the difference going forward. The use of tech to make an often iffy proposition, growing and selling food, into a more stable one, is all about precision: making traditional agricultural activities like planting, soil assessment, irrigation, harvesting, storage, and shipping more precise, cutting the time and cost needed to grow and ship your apples and pears and beef and rice and cucumbers. The Rasa Farm uses telemetry on some of their farming machinery, they use soil survey technologies and other precision ag software, specifically in conjunction with Google Glass, an experiment that has launched Rasa’s TekWear company, and they use smartphones and tablets for planting, growing, and market data. And they want to try drones. But what is the trigger for this shift into the highest of high tech by farmers? Why, and how, are farmers now turning to as unlikely a technology as drones, for instance? The explanation, according to Jeff Lorton, the organizer of the expo and the business development officer for the surrounding county, is conflict. With farming such a narrow-margin enterprise, farmers, Lorton said, are great adopters of technology. They can also go into their local bank and get a half million dollar loan “without explaIning much.” With the cost of the most exotic tech falling over time, small plot farmers have found that they can afford many of these upgrades and, if they are convinced they will reduce cost and increase sales, they are increasingly taking the chance even as they are more likely to make notes on a pad of paper than a digital tablet. Drones can be used for crop diagnostics. In cooperation with software, these remotely flyable vehicles that range in size from a Frisbee to a barbeque, some of which look like shiny white composite components of a spaceship and others like wireframes from the midpoint rendering of a video game and in configurations ranging from X-shaped to hemispherical to helicopter form, can fly high over a farmers fields and record damage to fields due to storms or disease, can talk to in-field diagnostics to discover where the soil is too dry, too wet, or too alkaline. Drones can also spray a field from the air. The proof of concept is Japan, where the fields are smaller, and require greater precision. UAV have been used there for 20 years. 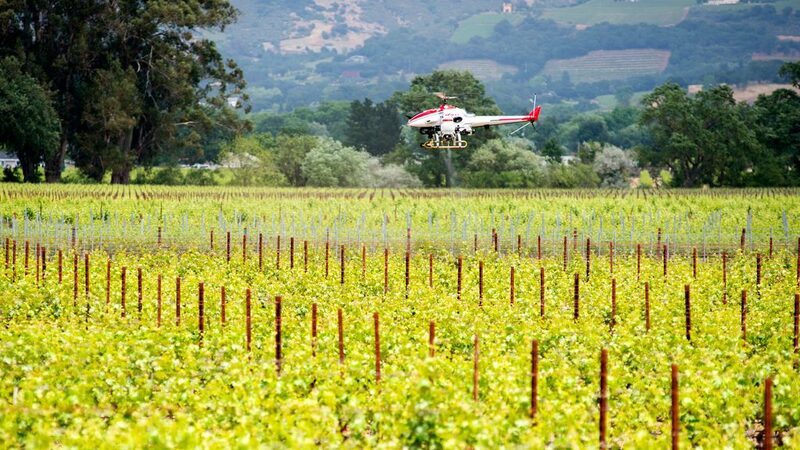 It is currently being tested (using water, not pesticides) on vineyards near Oakville, California by Yamaha Motor Company and engineers from UC Davis. The problem with the use of drones in agriculture is the paucity of rules governing drones over U.S. soil. The Federal Transportation Agency produces and enforces the strictures allowing manned flight but they do so based on an immense amount of data. Americans have been flying since Kitty Hawk. But the data surrounding drones – what works and what doesn’t, how accidents happen and how they’re avoided – does not exist. Fear of drones as another tool to breach American’s privacy is also important, given the national reaction to revelations surrounding the National Security Administration’s surveillance of citizens. In order to create that body of data on which to make cogent guidelines, the U.S. government last year accepted bids to create half a dozen drone test sites. The site managing entities are responsible for the policies for their sites and for their safety while they gather this data while, at the same time, allowing drone manufacturers and others to test the utility of the devices for, among other things, agriculture. The Pan-Pacific Construct, a coalition of non-profits headed by the University of Alaska, secured the bid to create a series of West Coast testing areas. The Oregon test area is headquartered at the Johnson Near Space Center in the coastal town of Tillamook, Oregon (currently most famous for its cheese) and managed by the Near Space Corporation. The area encompasses most of the Oregon Coast and, over the Coast Range, into the Willamette Valley. Another area, headquartered at the Central Oregon town of Madras, includes the Warm Springs Indian Reservation and other land in the middle of the state, with a third headquartered at the Eastern Oregon Regional Airport in Pendleton. These testing sites, along with sites in Alaska and Hawai’i make up the extensive Pan-Pacific UAS (Unmanned Aircraft Systems) Test Range Complex. Lorton and his crew petitioned the government to extend the range into Yamhill County specifically to see what it could do for agriculture. The New Stack has made plans to visit some of the testing areas to witness how drones are tested, what data is collected, and how the people involved change what they do based on what they discover during these test flights. The UAS trade association, the Association of Unmanned Vehicle Systems International, estimates that 100,000 new jobs will be created by 2025 thanks to this technology, with an $82 billion total economic impact between 2015 and 2025, according to Near Space’s Eric Simpson. Drones, however, are not the only precision agricultural technology in play in the U.S.Remote sensing technologies, soil and plant diagnostic probes and the software that brings that information together, and data management systems are in use by farmers across the country. But rivaling the drones when it comes to the cool factor is the Dawn of the Robots. One of the first questions non-farmers probably have when they discover that robots are becoming an element of agriculture is how many farm workers are being put out of work. The answer, according to the academics and farmers The New Stack spoke with is: none. One of the gravest threats to the family farm is the difficulty in staffing for planting and harvest. The work is hard, it doesn’t pay well, it’s seasonal, and the politicization of the immigrant work force has made it more difficult both to hire workers from outside the U.S. for those workers to get here, and the domestic farming population is aging, with an average age in the late Fifties. Given that labor, according to the U.S. Department of Agriculture, constitutes 17 to 40 percent of farm costs, any move that makes labor rarer (therefore more expensive) puts pressure on those farms. “The ag workforce is declining worldwide,” said Dr. Qin Zhang the director of the Center for Precision & Automated Agricultural Systems at Washington State University’s College of Agriculture, which develops automated systems and devices to maximize crop yields. The U.S. has lost entire agricultural crops to South America. Washington State was the number one source of asparagus for America. But because it was so difficult to get agricultural workers for a crop that is not a cash cow like soybeans or wheat, acreage in the state devoted to asparagus has declined 90 percent since 1999. According to the USDA, the number of farm workers employed in the U.S. has decline in the last century from 3.4 million to 1 million. As a proportion of the whole workforce, that loss is amplified. The U.S. Bureau of Labor Statistics anticipates another three percent decline in the agricultural workforce by 2022, which will cost the country about 25,000 more ag workers. However, when talking in a breakout session at the expo about the use of automated systems in agriculture, Qin said that, at this point in their development, there was good news and bad news. The good news is that automated insecticide spraying systems use only 30 percent of chemicals that are spent in free spraying, a fact that caused the PFE audience of mostly farmers to audibly gasp and mutter. A hop-twining robot WSU is working to improve was created in its developer’s garage, leading Qin to call possible the notion that in the future farmers may be able to employ 3D printing to create their own robots. However, his lab’s apple-picking robot remains a far cry from Star Trek’s Data. While a human picker can identify a ripe fruit, pick it and place it undamaged into a bin in three seconds, the best our robot chum can do is 10 seconds. Other less… human robotic endeavors have proven not just successful, but popular. Farmers have a profound motivation to plunge headfirst into this new world of precision agricultural technology: survival. (It is the same inspiration for its makers, who face a world without the endless trough of the U.S. military.) Combine that motivation to take chances on new solutions with faster, cheaper connectivity, the progress of miniaturization, more responsive programming, cheaper and more durable hardware and corporate investment in academic research and you have a situation that, while much less exciting than many of its boosters would maintain, nevertheless has immense potential to change agriculture and retain the family farm. But the companies behind these technologies, have to keep the farmers, and their specific needs, in their sights, said Rasa.